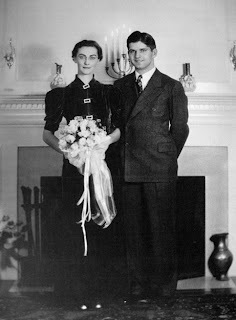 Margery Edson-Gould (pictured here on her wedding day) departed just a few days shy of her grandson Ben's own much-anticipated nuptuals. Margery Swan Huff Edson-Gould (6/20/15-5/6/08) passed away last week, and we’ll all miss her terribly. Everyone who met her they always walked away thinking, "So this is what a human can be." She was quite simply magnificent and her quality shines brightly in her daughters and through to her granddaughter Meredith, my lovely wife. I have been fortunate to know Margery for the past eighteen years and I am better for it. The first thing most people noticed about Margery was her fierce, burning passion for life. I say this not as a cliché about someone who is physically battered yet with a great lust for life, though by the end such a description would fit. She was physically precocious and her prime years extended well into what others would consider old age. She used to whip her grandchildren in tennis and was notorious for receiving speeding tickets in her VW Scirocco. She lived life as one on fire yet she was always calm. She would have made a great coach, and she was, in fact, very interested in [and opinionated about] sports. I'll never forget the night I got us prime seats at the U.S. Track & Field Championships. I told a few people there that her grandfather had been an early Olympian but the luminaries of the running world treated her as a star that night for reasons not even they understood. There was something about her that commanded respect. Maybe it was her eyes, which were perhaps Meredith's greatest inheritance. Margery inspired those around her not only by setting a great example, but by taking a very real and thoughtful interest in everyone she met. She was extraordinarily generous with her thoughts, praise, and many small gifts. She never met anyone she considered a hopeless case and saw great potential for good in everyone. She told them so and they wanted to go out and make good on the promise she found in them. Perhaps that explains her rapid ascent from the gym teacher to high school principal and beyond. She would have been a great politician and perhaps president in a different sort of world. But she changed many lives nevertheless. Her influence was meted out in small conversations, cards and bouquets, winks and many, many hugs. She lived a very full and rich life and hers is an example I would gladly follow.